My first collection, River is the Plural of Rain, was published by Oversteps Books in 2009.
as stream follows after stream. and every drop is dreaming of sky. ‘River is the Plural of Rain’ is copyright © Rebecca Gethin, 2009. 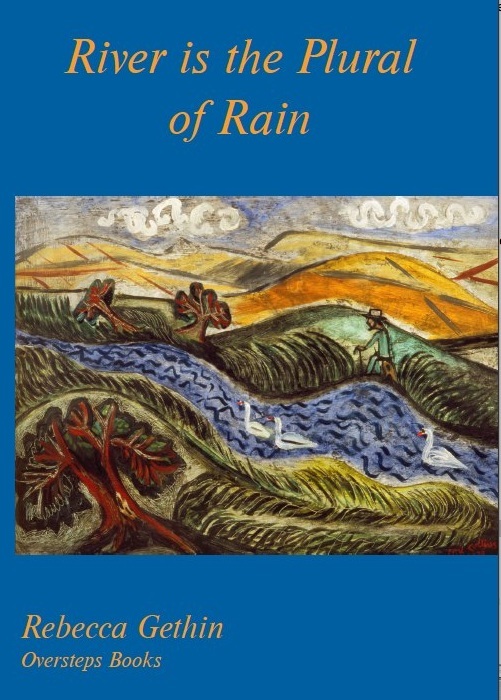 It is reprinted from River is the Plural of Rain by permission of Oversteps Books. a single note, at regular intervals. the colours of feathers, eye, and beak-shape. then hides under leaves, its eyes motionless. as well as the space behind a house built on a hillside. only a syllable away from being extinct. nor the limits of my body. frays the darkness. Insects bombard the pane. the pen, nib scratching fibrous paper. peering at type-writer keys, deciphering codes. revolve in the orchard, a sheep coughs. works on till the moths sleep.